A lovely flat, very clean with wonderful views over the marina. Thank you once again Mr and Mrs Bouet for a very relaxing and comfortable week. We appreciated your warm welcome and treats that you left out for us. We spent our time walking along the long sandy beaches and eating the great fresh fish and seafood, especially the mussels in Josspinet. Hopefully next time it will be for longer. The apartment was spotless,bright and airy.It had everything you needed.What was particularly good was the layout,as my daughter and her boyfriend had their own private space,including their own balcony with a view over the port and bathroom.There was a terrace for four at the back too.The owners were welcoming and helpful.The town itself was lovely and picturesque.A bonus was a free bus to the town which we used if we didn't feel like walking.Lots of authentic restaurants in the port itself.We had some lovely meals. 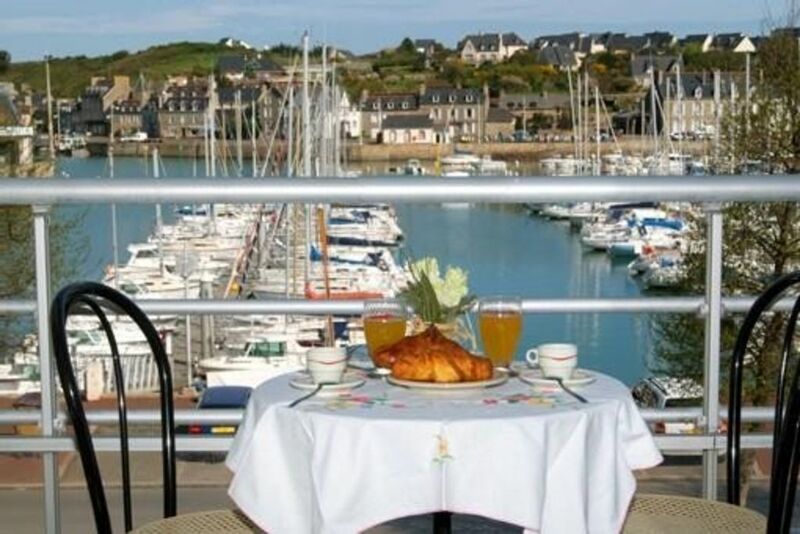 We enjoyed our stay in Port de Dahouet. Lovely coastal walks to Val Andre and around Equey and Cap Frehal. Rennes and Dinard also within reasonable distance. The apartment was spacious and well equipped, shame we didn't have the sun to enjoy the balcony. Limited bars and restaurants in October although did have nice meal at La Voile in the port. We received a warm welcome from Andre and his wife and gift of cider and Breton cake, thanks. Thank you, we are glad you enjoyed the stay in the apartment. We had a fabulous time in the lovely Duplex and hope to visit again in May or October. The Duplex is ideal with a balcony facing south and very private. . Location fab. Very quiet and tranquil ideal for a complete rest . Lovely beaches and nice places to visit. It has everything to suit us. We highly recommend it. No tourists its like going back in time. However the sofa for us could do with not being so hard we find it very uncomfortable of an evening but we are all different. Great little Gem. We love it. Beautiful apartment, well equipped, great location with fantastic views. Very friendly owners. A very beautiful part of France with few tourists and some great restaurants. We had a really enjoyable holiday. Nous avons beaucoup apprécié les moments passés ensemble lors de votre arrivée. Nous espérons vous accueillir peutêtre à nouveau une autre fois. Pour une réservation de deux semaines consécutives, remise de 50€ appliquée sur la deuxième semaine Une caution de 200€ par chèque est demandée lors de votre arrivée; ce chèque vous est rendu lors de votre départ Lors de votre départ , nous pouvons nous charger du ménage contre un forfait de 40€.